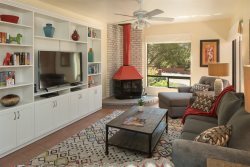 Cute Condo in the friendly Casa Bonita Complex in West Sedona. Sleeper Sofa & a Fold-A-Bed. High Speed Internet w/ Wireless Access. This complex is in an ideal location as it is near: Shops, Eateries, Hiking Trails and Galleries. Owner prefers to have this unit rented all the time and will consider any reasonable offer! Pleasure to work with Foothills Property staff; questions are quickly answered and any issues quickly addressed. Nice condo in a great location in Sedona; walking distance to grocery stores, restaurants and pharmacy, and short drive to amazing hiking trails. Friendly, professional, knowledgeable and helpful Team!! Great location I walked to pick up car rental, walked to go food shopping, walked to restaurants and walked to movies. Excellent location!!! We have used Foothills for over 15 years and have been very satisfied with their service. They are the best choice in Sedona.